Posted by Stuart Herbert on March 18th, 2007 in Abercanaid, Glamorganshire Canal, Historical, Merthyr Road, Modern, Shoot, Taff Trail. I went back up to Abercanaid this morning and shot some additional shots of the Graig Chapel Burial Ground. In my original diary entry, one of the lessons I learned was that I hadn’t shot enough coverage – I had no shots of the Burial Ground as a whole, nor really of how the Burial Ground fits in to the surrounding area. You can see the four additional shots as part of my photo set on Flickr. Posted by Stuart Herbert on March 14th, 2007 in Abercanaid, Glamorganshire Canal, Historical, Merthyr Road, Modern, Shoot, Taff Trail. View all of the photos from this shoot as part of my Merthyr Road collection on Flickr. After the extremely wet weekend the week before, I was determined to get out and about this weekend, and to continue my exploration of the old Glamorganshire Canal route between Merthyr and Cardiff. Guided by the excellent Glamorganshire and Aberdare Canals book, I headed north to Merthyr and traced the canal route south from Chapel Row. At Abercanaid, I came across the remains of the Graig Chapel burial ground (the east side of Graig Road, the whole section north of Anthony Grove). I’m not exactly sure when the Chapel itself was demolished; it appears to have been still standing in 1996, and it appears to have been demolished due to subsidence. Looking at the photos from 1996, it looks like the burial ground wasn’t adjacent to the Chapel, but without more research I don’t know enough to say for certain. Today, the burial ground has gone to ruin. Many of the headstones either lie flat in the undergrowth, or have been vandalised and are no longer there. During my visit, I spotted about half a dozen headstones still standing, and I did my best to record the names on the surviving headstones. Tomorrow, the headstones will be gone. Glenn Kitchen, represented by Hugh James Solicitors of Merthyr Tydfil, has posted notice under the Disused Burial Grounds (Amendment) Act 1981 that he will remove the human remains, headstones and other memorials for re-internment at Pant Cemetery, Dowlais, on 4th May 2007. It is his intention to “erect a building for residential use” where the burial ground currently stands. 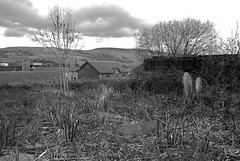 As I came south along the old canal towpath into Abercanaid, it wasn’t the burial ground that caught my eye. On the opposite side of Graig Road stands a pretty detatched house, and it was that house that I originally stopped to photograph. I’m not sure how I feel about the intention to turn the burial ground into a residential building. I’m not religious, and when my time comes I’d rather be cremated. I don’t particularly want my remains to go into the ground. But, on the flip side, there are plenty of other folks who feel differently, and I was certainly distressed that the local authorities had allowed the burial ground to end up in the condition it is in today. It’s my intention to return to Graig Road over the coming months to make a record of the building that Glenn will build on this spot. I’m curious to see what sort of house ends up there. It’s not often you stumble across a small piece of history in time to record it happening. This photo showing one of the surviving gravestones, with the house on the opposite side of Graig Road, is my favourite photo from this shoot. I like the crispness of the image and the general tonal range of the shot (although the blown highlight of the side of the building lets it down a bit). Shoot enough coverage! Lord knows I didn’t. I only have one shot of the plot as a whole, and only one shot showing where the plot sits in relation to its surroundings. That simply isn’t enough. I’ll be going back as soon as opportunity allows to bag some additional shots to complete this shoot. Pay attention to your highlight warnings. Most of the scenes that I shot of the weekend contained shadows and highlights that stretched my D200 beyond its limits. It’s easy enough in Aperture to recover information from the shadows, but blown highlights simply don’t contain any information at all. The usual technique for dealing with this problem is to fit a neutral density gradiated filter (aka an ND grad). I don’t have any ND grads to fit the large diameter of my Sigma 15-30mm lens. Instead, I stopped down by a third (or often more), to try and limit the blown highlights to just the open sky instead. Don’t limit yourself to just one attempt at a shot. I’m not saying go snap-happy – I don’t believe in the idea of quantity over quality – but do remember that you’re shooting digitally. You can take as many shots as you want, and all it costs you (worst case) is a little bit of time to edit out the really rubbish ones on-site (to avoid having no room to take any more shots). If, like me, you prefer to shoot in RAW mode, 8 Gb cards are now very affordable. I reckon you could fit something like 600+ compressed RAW images on a single 8 Gb card. The workflow I briefly mentioned a few weeks ago is working out well for me. I’ve picked up a copy of ScreenSteps, and I hope to post a tutorial about this before the end of March.